Chuck Neville has been designing deep water Motor Yachts, Trawlers, and MotorSailers for over 25 years. Over that period work has included boats from 29 to 100 feet designed for both fiberglass and metal construction. Most recently focus has been on moderate sized cruising boats for steel or steel and aluminum construction. In addition Charles Neville associates is active in the design and certification of commercial vessels, including motor catamarans, intended for Coast Guard small passenger service. Chuck is always happy to correspond or talk with owners or builders about their individual plans and dreams. 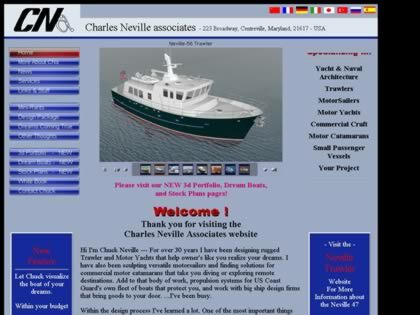 Web Site Snapshot: If available, above is a snapshot of the Charles Neville Associates web site at http://www.nevilleboats.com as it appeared when this site was added to the directory or last verified. Please Note that Boat Design Net has no involvement with the above web site; all content and images depicted in the above thumbnail are the property and copyright of Charles Neville Associates unless otherwise noted on that site. Description: Chuck Neville has been designing deep water Motor Yachts, Trawlers, and MotorSailers for over 25 years. Over that period work has included boats from 29 to 100 feet designed for both fiberglass and metal construction. Most recently focus has been on moderate sized cruising boats for steel or steel and aluminum construction. In addition Charles Neville associates is active in the design and certification of commercial vessels, including motor catamarans, intended for Coast Guard small passenger service. Chuck is always happy to correspond or talk with owners or builders about their individual plans and dreams.